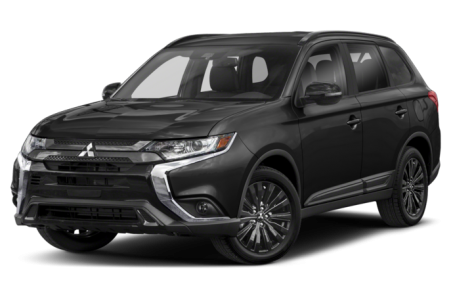 The 2019 Mitsubishi Outlander is a compact SUV that seats up to seven passengers across three rows. Maximum cargo capacity is 63.3 cubic feet with the rear seats folded down. Four trims are available: ES, SE, SEL, and GT. Under the hood, the Outlander is powered by a standard 166-hp, 2.4-liter four-cylinder engine mated to a continuously variable automatic transmission (CVT). A more powerful 224-hp, 3.0-liter V-6 paired to a conventional six-speed automatic is available for the GT trim. Front-wheel drive (FWD) comes standard, while all-wheel drive (AWD) is optional.